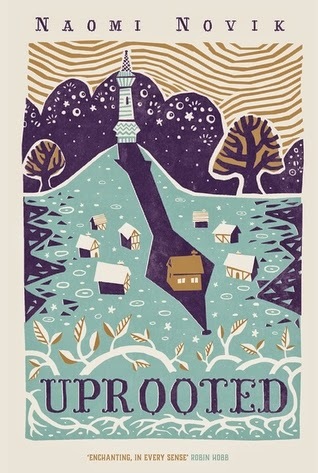 Synopsis: Agnieszka loves her valley home, her quiet village, the forests and the bright shining river. But the corrupted wood stands on the border, full of malevolent power, and its shadow lies over her life. Review: THIS BOOK! This is one of those books that you want to bounce about and then go around telling everyone how much you enjoyed it...which I've sort of maybe already started doing. Sometimes someone's writing just gets you, you can't really explain it, there's just something about it you really resonates with you, and this was one of those times. This actually wasn't next up on my reading list, so the only thing I can think of is that the forest got out and drew me in. And i'm glad it did! The story itself isn't necessarily something new, it draws in a lot of different fairy-tale/fantastical elements but makes them into its own so that the story feels familiar but at the same time it's a whole new journey down the Spindle. Agnieszka (bless you! Sorry...It just feels like I'm sneezing every time I try and pronounce it! No offense meant by this!) was a strong lead, supported and enhanced by the characters around her, not least the Dragon, which not only is a cool title, but he was just reserved and moody enough for me without tipping any sort of balance so that I didn't gel with him. The Falcon on the other hand was just sleezy and you loved to hate him...well not hate, just be annoyed by him in a good that that you want to be. ANYWAY! The base line is the characters were good...and would wouldn't want to meet the Wood-Quuen out alone without a lot of magical supplies! The story itself flowed much in the same way as the river...building in parts, then taking it slower and then building again until we reach the source, and ...what happens happens, and I'm not about to tell you what that is because you need to go and read it. I will say that I LOVED the ending of this book, and the way it changed up the tone, and created this beautiful visual memory. I think that is one of the strengths about writing a forest as a character, because it has such strong visual ability, and its character here was dark and powerful and that really build a great forest in my head. I had in mind the forbidden forest, but with a little more daylight, thrown in with a little of Tom Bombadil's Old forest. You need a magical forest for a magical book right and the magic her has a sort of subtle seriousness that really worked well for me. It wasn't overstated but fitted in well, and if I could do some of the thing that this magic allowed I'd be quite the catch. I've been reading a lot of series lately, so in many ways I loved how this was a complete novel rather than something I really enjoyed that then left me hanging...what it now allows me to do is go on and read other worlds by this author which I'm excited to do! The dragon standard has been set high so we'll be seeing about that. Bottom line is...try this book, I really enjoyed it and I think you will too!